Still interested in keeping that Classic Plan? Do you have the need to own a Samsung Galaxy S 4 in the near future? If you can answer yes to both of those questions, Walmart has a price that seems right in line with flagship smartphone pricing. The $198.00 price tag is just a dollar below the standard flagship price of $199 is good for both the Black and White variants. Like all stores expected to carry the Galaxy S 4, inventory is limited so make sure to check with your local Walmart to find out the where and when for how you can pick one up! I’m contemplating swapping my Note 2 for the GS4. 5 inches and 1080p sounds like just the perfect thing for me! If I buy this from Wal-Mart and resign another two-year contract, it would not mess up my bridge-to-value classic plan, right? yes it will. you will have to wait 18 months on the line you upgrade before you can go to the value plan. Wait, uhm..I’m currently still under contract until next month. When I called a couple of months ago, they told me they can increase my data plan and pay less. So I have a 6.5 GB data plan from 5 GB and I’m paying $20 less. If I buy this from Wal-Mart, can I keep this plan or have to sign a new plan? My guess is that also does not include a free or discounted phone. I’m sure that you won’t get this deal at $20 less with more data and a subsidized phone. more data and cheaper monthly rate is in exchange for you paying full price for the phone I think. I’m still having a hard time deciding between this and the One!!! I went into an AT&T store yesterday to test drive both, and man did I walk out even more conflicted! Though I will say this: Pictures do not do the HTC One justice!! It’s one gorgeous piece of hardware! i too was conflicted but it came down to function over design .. the One is beautiful but its features fall so far short compared to the GS4. so do you want beauty or function? I dunno man I played with the One at best buy and I was actually underwhelmed. I think so much talk of how “amazing” and “superior feeling” it is made me expect more than was possible from it. I mean it was nice looking don’t get me wrong, but nothing amazing. no. not with this Classic Plan offering. you’d just pay the $198 and sign a new 2-year contract. And it should be noted it’s only for existing Classic plan customers as T-Mobile no longer offers them to new customers. That’s not true. Third-party sellers like Walmart and Best Buy still offer classic plan until T-Mobile works out a way to make EIP work with them. I believe you misread my response. T-Mobile does not offer Classic plans to new customer any longer. Actually this is not what I was told when I bought my HTC One from Walmart yesterday. When I asked about buying the phone she told me they could not start new contracts on T-Mobile. I told her I was upgrading and she said I could do that. She explained that they could only do upgrades for T-Mobile and were not doing new lines for T-mobile until the infrastructure was in place for new plans and EIP. Not sure if this was a case of a Walmart employee not knowing what they were talking about, but it was an awful lot of info to be wrong about if that was the case. One thing to keep in mind when purchasing from Walmart is that I believe you only pay sales tax on the $198 versus tax on the entire retail value of the phone with T-Mobile. Not sure I’m following what you’re saying. Sales tax on a device is the same no matter whether you’re on a Classic plan or Value plan and it isn’t added to your bill. What I mean is that the cost of a Value Plan + $20 EIP is typically the same as the cost of an equivalent Classic Plan; however, the $20 EIP isn’t taxed monthly because you’ve already payed the tax for the phone. My comment and this article has absolutely nothing to do with whether or not a customer will save $ on the Simple Choice plan over their Classic plan. It’s been proven this won’t be the case for everyone. Each customer needs to decide on their own. For the customer that chooses to stay with their Classic plan, they’ll pay less sales tax on the device through Walmart than with T-Mobile. That was my point. Yup ST on the 198 plus 18$ upgrade charge from t-mo not bad actually. Do you have to be eligible for upgrade to get the $198 price? And it’s paid for. I ll use until it stops working. Any idea when it will stores ? So I could start checking Walmart’s Near-by ? what is data req with Walmart classic plans ? I don’t think it matters, when I went from a dumb phone to a smart phone it was at Walmart and they didn’t even make me put the data plan on I just told them I would call TMo customer care and get it added and they accepted that. If you’re asking about the data plan for a new Classic plan through Walmart I have no idea. Can you do this with an old grandfathered plan or dies it have to be a new classic plan? Now that they deleted the offending post mine makes no sense. Someone was trying to sell services. This will work for any classic plan you’re on whether it’s old or new to my understanding. Its not available at several stores I called in the Miami area. please Samsung to fix it soon. That’s why I never buy the first batch. I wait for at least 3 months before buying to make sure any defects or bugs are worked out. I took my licking with buying the first batch of Mytouch 4Gs and getting the bad screen, which HTC fixed later but anyone with one was SOL. Edit.. LMAO@me. I thought I was still at that Arena site. I always check there then here several times a day… so ignore this comment… as it pertained to at&t. Wow. I have never commented on the wrong site before. I must be getting old…. geez… Can you find it in your heart to forgive me David!?! I love me my T-Mobile and my T-Mo News!!! What happens If I’m currently on a Classic Plan, get the phone and then about a month or two later wish to change to a simple choice plan? Would I be able to? You would have to pay a $200 migration fee is what Customer Care told me but at the TMo store they told me I’d just pay a $20 fee so who knows. Since I work for Tmobile, I thought I’d help out. There would be a $200 migration fee. Honestly, just get it at the 149.99 down that the value plan does. It’d be cheaper overall if he bought it for $198 from Walmart and then took the $200 hit in migration fee. That’d be only $398 for a phone that cost him $630 on what you’re suggesting. Work the system while you have the chance. I was going to jump at the GS4 from Tmo for $149 up front but I decided to wait for Google I/O before I make my decision. 2 more weeks and I’ll decide. When will tmo release the Black one? Just called the Walmart closest to home and they have the HTC One in stock only 1 left but no S4 yet and he doesn’t know when they’ll get it. If it were for me I’d get the One but it’s for my wife and she’s having a hard time deciding between the S4 and the HTC One. 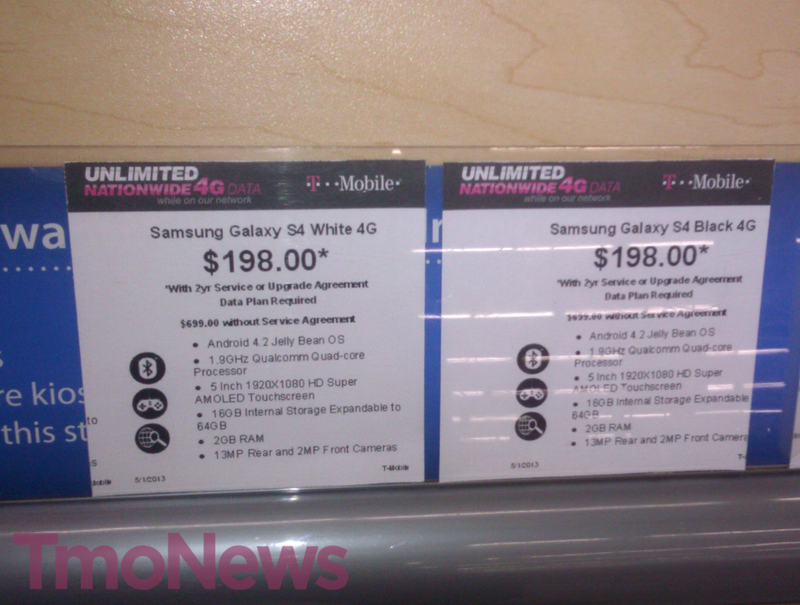 Walmart has the White and Black now, 16GB, he said they’ll only be stocking the 16GB.